Here comes May Long! While summer officially begins in June, it always seems as if the Victoria Day long-weekend is the true beginning of summer. It’s that glorious time of year where we all get out of the house to enjoy the great outdoors. So whether you’re into fish, snakes, horses, hikes or history our hot list definitely has something to whet your whistle. Manitoba is alive with snakes! Spring is a hotbed of activity at the Narcisse Snake Dens in the Interlake. It’s here that you can see more snakes at a glance than anywhere else in the world. Watching tens of thousands of red-sided garter snakes get it on at the snake dens came in at number five on our list of Top 10 wildlife encounters. Fishing season is now open in Manitoba! Open water season can’t start soon enough for all of our anglers who are itching to hit our fully-stocked lakes and rivers. Are you ready to get hooked? That Master Angler fish is waiting. Did you know you can now submit your catches as fast as you can reel them in? Download our Manitoba Master Angler iPhone app to easily submit a new catch and to keep your records within reach (for when you really want to brag to your buddies about how awesome you are at fishing). Rising dramatically from the prairie landscape, Riding Mountain National Park is a vast expanse of boreal forest and pristine aspen parkland that is sure to enchant and inspire you. You’ll feel like you’re standing on the edge of the world as you hike the Escarpment trail system, where the Manitoba plateau falls away 300 metres to the prairies. An abundance of wildlife, forest trails and lakes have attracted nature lovers, camping enthusiasts and summer cottagers for generations. There’s truly something for everyone in this scenic region. May 17 | 11:00 a.m.
All aboard! 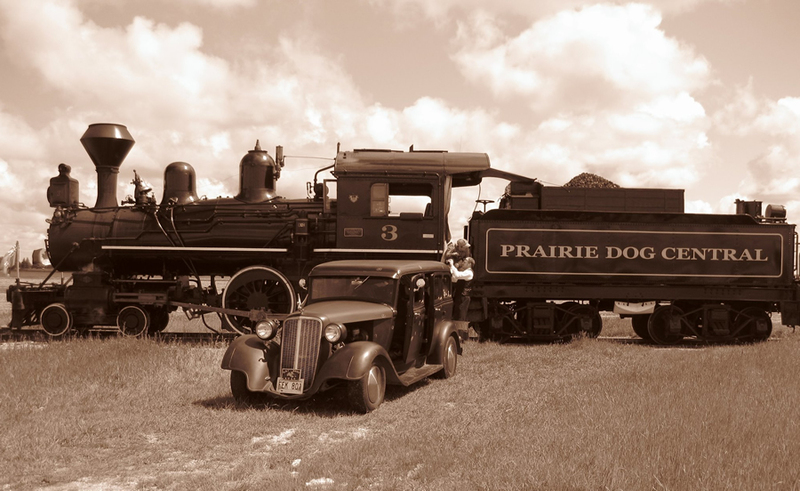 Travel back in time to the Wild West and experience a Great Train Robbery on the Prairie Dog Central! Get your tickets to ride the rails and enjoy a fun re-enactment of an old-fashioned train robbery, where bandits on horseback or in vintage automobiles storm the train along the line. Whether the channel catfish is the ugliest fish to inhabit Manitoba waters is certainly a topic of debate. What isn’t up for discussion is their ability to deliver fantastic fishing action, no matter if they are big or small. You can catch these toothless fighters in lots of places in Manitoba, but if there’s one place that offers increased odds, it’s near Lockport on the Red River. Mosey on over to Birds Hill Park Ranch, Falcon Beach Ranch or Tumbleweeds Ranch to enjoy a trail ride while breathing in the warm spring air and viewing the spectacular scenery. Don’t forget to bring your camera! You may see deer, owls and various other wildlife. Picking which club to use to make that shot may be easier than deciding which of Manitoba’s more than 120 golf courses to play. From lakeside links, to fairways next to farmers’ fields, to putting greens nestles along rocky Canadian Sheild outcrops, tee off at top courses surrounded by Manitoba’s natural beauty. Spring is the best time of the year to hike McGillivray Falls as the rapids are rushing from McGillivray Lake into Caddy Lake. The falls are located at the beginning of the trail and from there you can hike a short 2.8 km loop or take the 4.6 km loop. Don’t forget your water-proof footwear! In Manitoba, we serve up a thick slice of our history, in cake, torte and pastry form. Whether drawing inspiration from Japan, France, or simply from a serious doughnut craving, you can count on our sweet spots to be every bit decadent. Photo by Andrea Di Ubaldo. Treat yourself to a full-on romp in the picture-perfect Assiniboine Park. Winnipeg’s urban playground is a delightful maze of gardens, walking and biking trails and indoor attractions. Feed the birds at the duck pond, roam over to the Assiniboine Park Zoo to say hello to wildlife species from around the world, stroll through the Leo Mol Garden, play all day at the Nature Playground, or lay down some eats for an idyllic afternoon picnic. Feast on freshly produced goodies at your local farmers’ market! This is the perfect time for you to shop for locally-produced foods and discover the real great tastes of Manitoba. Yum! Here’s a list of markets province-wide and Winnipeg-specific. Hanover’s annual Spring Rodeo is an exciting weekend of fun and entertainment! Participate in the Rough Stock Riding School on Friday and Saturday, or cheer on the contestants during the Gymkhana, Manitoba High School Rodeo and the Manitoba Cutting Horse Association cutting horse show. There’s a full canteen with great food all weekend as well as a chicken BBQ on Sunday. May 16 | 1:00 to 3:00 p.m. Explore this unique and fragile ecosystem with the Park Interpreter and discover the plants and animals that fight for life in its extreme conditions. Please bring proper footwear and drinking water for this 3km hike. Come back to the park at 8:30 p.m. to watch the film Sand Cinema: The Spirit Sands, which unravels the mystery of the shifting sand of Spruce Woods, from the immense expanse of sand left behind from the last ice age to the remnants of open sand remaining today. The film details how the struggle for life has led to today’s dunes, plants and animals. Children under 12 must be accompanied by an adult to all events. Sign up for an unforgettable evening of magic, mystery and architectural wonder on the Hermetic Code Tour. The charismatic Frank Albo, researcher and inspiration behind the bestseller The Hermetic Code, will take you along a step-by-step tour to reveal a trail of occult clues concealed in the building’s architecture including: hidden hieroglyphic inscriptions, numerological codes, and Freemasonic symbols so intelligently masked they have escaped historians and visitors for nearly a hundred years! This is part of the Canadian Signature Experience collection. Hitch your horses and pack your luggage for a harrowing tale of migration and settlement at the Mennonite Heritage Village. Travel through time to a turn-of-the century Russian Mennonite street village on our 40 acre site, taste traditional Mennonite fare at the museum’s Livery Barn Restaurant, and explore a classic Mennonite housebarn and a fully operational Dutch windmill during the summer. On Tuesday, May 12, celebrate Manitoba’s 145th birthday at the Village! There will be a short program at 9:30 a.m. at the Steamer Shelter, speeches by dignitaries and local government officials, and flag raising ceremony. $2.00 admission. On Monday, May 18, celebrate Spring on the Farm at the Village! There will be a tractor parade, tractor games, pioneer demonstrations and delicious Mennonite food. Photo by Aaron Cohen / CMHR. Contemplate inspring stories of struggle and triumph at the Canadian Museum for Human Rights. This new national museum strives to create inspiring encounters with human rights, by engaging you in an immersive, interactive experience that offers both the inspiration and tools to make a difference in the lives of others. Take the entire brood to see the famous families of ancient Greece and Rome at Olympus. Spanning almost 10 centuries of artistic production, this extraordinary collection features over 160 ancient treasures including statues, vases and jewelry. Got a tip for a future Hot this week? Send us your suggestion and it might just make the list! Comment below or tweet us @travelmanitoba.